The man is a consumate musician. What I enjoy about Marlon is not so much his ability (which needs no mention – he is an unbelievable musician), but his willingness. In my mind, that’s a true mark of a professional right there – someone who will take his level of proficiency, his gifts, abilities and everything else he is good at, and willingly offer them to this project. It’s worth mentioning at this point that every member of the RCB has this attitude, and I love that about them. They’re all far, far better musicians than I am, and yet they support me and give of themselves easily. We need more people like that in this world. So you’ll hear a guitar solo or two from Marlon here and there on the new album. But as an engineer he also got stuck into me, encouraging me and showing me how to improve and get better at my craft. I have emerged out the past five weeks more inspired than I’ve ever been at being better. At everything. I like that Marlon is irritated by untidyness. In an industry where the orderly gives way to the creative, it’s been nice to arrive to a clean studio every night. I joke with Marlon and ask him how he would rate his obsessive compulsive disorder on a scale of 1 to 10. He’s probably around a 7… borderline for an artist! For this project we used Logic 5.5.1, a RØDE microphone and a few items from his Roland keyboard. What more do you need? Life has been busy, but it’s so been worth it, just to spend time with this guy. 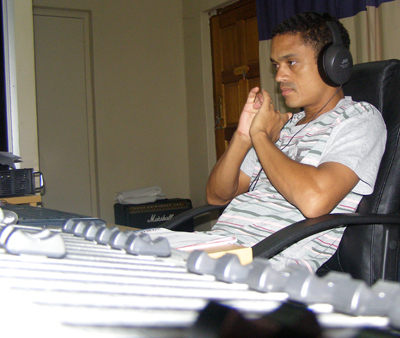 The album now goes to Brent Quinton at Sesalos Studios where it will go through the final mixing and mastering process. Brent has over a decade of experience as a professional, having worked on many prominent South African artists’ albums – Tree63, The Finkelstiens and Nibs van der Spuy to name a few. I am looking forward to hearing what he does with our humble tunes.